The Marlow Explorer features a unique twin keel design combined with her raised pilothouse, Portuguese bridge and wide side decks. She is an ideal cruiser with a full complement of state of the art equipment, technology and luxury. An amazing 18'2" beam provides the wonderfully spacious stand up engine room Marlow Explorers are noted for and commodious interior spaces from the salon to the staterooms. There are three staterooms below, master and VIP, with full heads and one more guest stateroom that can double as an at-sea office. The u-shaped galley is in the aft part of the raised pilothouse and features every convenience and appliance to make your galley duties a pleasure. The dinette is next to the helm and is comfortable, roomy and presents a lovely view through the pilothouse windows. Two steps down from the pilothouse is the saloon with built-in seating that doubles as storage with pneumatic lifting hinges, wet bar with storage, TV/Stereo cabinets and lovely teak coffee table. United Yacht Sales New Jersey would love to guide you through a personal showing of this 53' Marlow Me 53c 2005. 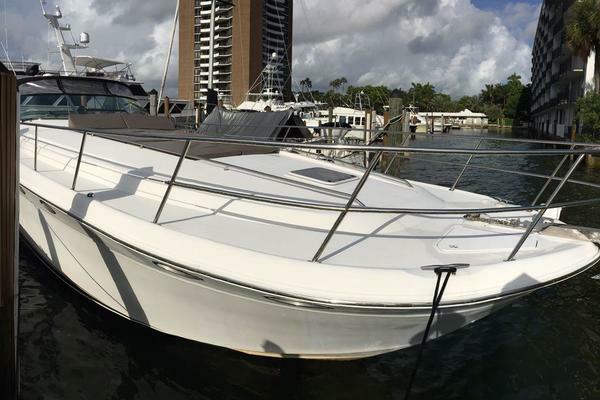 This yacht for sale is located in Snead Island, Florida and priced at $1,099,000. For a showing please contact us by filling out the form on this page and we will get back to you shortly! The raised pilothouse, Portuguese bridge, wide side decks, and state of the art semi-displacement hull makes the Marlow Explorer one of the most comfortable, safest yachts in any sea condition. The side decks are fully protected by fiberglass bulwarks topped with teak cap rails that are waist high aft and higher forward. The foredeck is accessed through the Portuguese bridge doors. The twin stainless steel anchors are set up with dual gypsy windlass. On either side of the windlass, deck lockers open to expose the forward set of shore power electrical inlets, cable TV and telephone inlets and shore water connection. Glendinning faucet for the fresh wash downis also in these lockers. The bow rail is heavy oval stainless steel package. When you see a Marlow Explorer on land you notice very quickly that the yacht is blocked at the bow like every other boat, but at the stern she is sitting on her own twin keels. The propellers and rudders are well above the bottom of the keels and it is obvious that a light grounding on a sand bar will only result in some worn bottom paint. What is not so obvious is how these strut keels will make the boat handle in a following sea. The location makes the boat track straight with very little rudder correction. On deck you can see that the teak planks do not have bung holes hiding screws, they are epoxied in place. You can tell that the deck is molded as one piece because there are no seams from the transom to the bow, including Portuguese bridge. The windshields and side windows are tinted glass and laminated with a layer of 3M Hurricane shield to a total thickness of 12mm, twice what most builders use in vessels below 100'. The teak rails are perfectly finished with many coats of the finest varnish. The hull is molded in Oyster white gel coat and topped with 2 coats of Oyster white Awlgrip with a coat of clear on top to keep her shiny. It is obvious that the mold was perfect because you cannot find a ripple in her 53 feet. She will keep her form because the Vinylester resin encases two layers of kevlar and many layers of non-woven fabrics that are vacuum bagged to the Corecel structural foam core. Solid D-shaped stainless steel rubrails protect the beautiful hull sides. The inner laminate is all high tech non-woven fabrics. The bilges are smooth and finished with gel coat like the rest of the yacht. In the cockpit cabinet under the stairs there is a plug-in wired remote third control station. This device will let you operate the shift controls and throttles for both engines and also use the bow and stern thrusters. The 550 twin gallon fiberglass fuel tanks can be filled from either side of the yacht. The lube oil tank fill is also located in this locker that is a convenient height about 12" above the deck. The water fills are also located on either side of the pilothouse right below the windshield. Fuel tanks and water tanks can be filled from either side of the yacht without dragging hoses across to the other side. You can get to everything quickly and safely with 6'2" head room and walkways outboard of the engines. The area is well lit with 110V and 24V lighting. There are 110V and 24V blowers to cool the space down after a run and the area is air-conditioned so maintenance can be done in comfort. There is a large stainless steel mirror on each side of the engine room, angled perfectly, so you can inspect the outboard side of the engine without going outboard. Each diesel engine has dual Racor filters. The fuel system is very simple with 2 large tanks that may be cross-connected to operate as one (1100 gallons total). The tanks are located on the longitudinal center of buoyancy, precluding the need to shift fuel fore and aft to maintain proper trim. The engine beds are very heavy polished stainless steel and secure the engine vibration isolation mounts to the hull stringers and run all the way past the transmissions to accept the thrust load of the Centa units. The dripless shaft seals have a crossover tube that supplies water from both engines so you can safely run on one engine. There is a 20kW Northern Lights Generator in a sound shield with Lexan sound shield panels. Just forward of the engines on centerline of the room is a Sea Chest with removable clear cleaning port. Each of the engines, generator, air-conditioning system, salt water wash-down and all the other components of the yacht that require salt water have their own shut-off valve on the sea chest. One hull opening for all sea water needs provides great safety. The 700 HP Caterpillar engines are connected to the underwater exhaust system via high temperature silicone hose to further isolate noise and vibration. 4Glendinning cablemasters, 2aft and 2 forward. The flybridge is an excellent place for fair weather cruising and entertaining guests. The double helm seat is on the centerline. A full set of Caterpiller electronic controls is immediatly forward of the large stainless steel wheel. The VHF and yachts intercom phone are within easy reach. 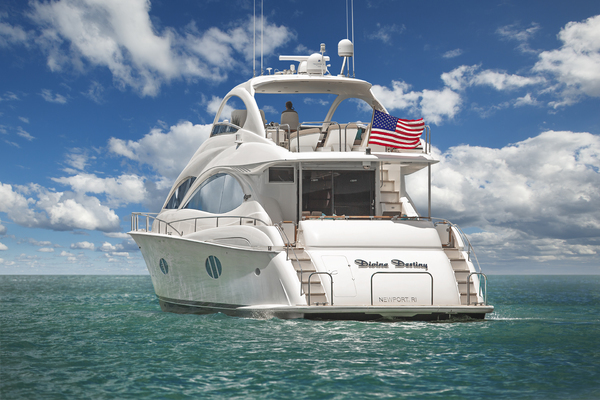 The Flybridge is protected by a lowerable radar arch and lowerable bimini top. The flybridge is accessible by stairs from inside the pilothouse and outside from the aft cockpit. There is comfortable seating for eight people, with a table. There is a sink, refrigerator with icemaker and plenty of storage as well as an electric grill. The 1,000 pound hydraulic davit with remote. The pilothouse is up three steps from the salon and includes the lower helm station, dinette and galley. There are port and starboard watertight exterior doors. A staircase forward to starboard descends to the three staterooms and a staircase on the port side aft ascends to the Flybridge. The lower helm is another very comfortable area, complete with Admiral Blue helm chair for the captain next to a gorgeous teak dinette with Brisa Cream Ultraleather seating for guests. Forward of the helm chair you have all the systems a captain would need. The engine displays, VHF, and other critical systems are all within easy reach. The overhead panel has the vessel safety and control center. The yacht has Kahlenberg airhorns, electronics circuit breakers, Inverter control, water maker control, tank tender fluid level monitor, navigation and anchor lighting and bilge pump controls. As you enter the salon from the aft deck you feel the spaciousness of the vessel's 18'2" beam. The composite construction has allowed this space to be very open permitting you to see beyond the salon and galley to the front windows. The tinted windows and wooden blinds allow just the right amount of light into this space. The door you entered is one of a pair. On nice days when you want natural ventilation the second aft door can be slid open to create a 5' wide opening. The large L-shaped settee is upholstered in Brisa Cream Ultraleather that is beautifully tufted. Under the salon seats there is a string of 110V LED lighting that provides perfect accent lighting. The deck light circuits and 110V plugs are on the 4,000 Watt inverter so you do not need shore power or the generator to have these on. There are two settees, reading lamps and rugs. On the forward end of the salon there is a 37" Sharp HD flat-screen TV, DVD player and Channel Master video cable/splitter. There are 5 overheadLED lights in addition to the 24V Italian and Cabin Danmark lighting and valance lighting. There is a beautiful large teak table in front of the settee. The table also has magazine racks on the ends and is on a gas strut allowing it to be raised and lowered. The overhead teak valance on the starboard side has slots that diffuse the air-conditioning so you do not have air blowing directly on you. On the portside forward is a wetbar with Sub-Zero two-temperature wine cooler, stainless sink with Grohe faucet, U-Line icemaker/refrigerator and an additional cabinet with storage for bottles and glasses. The galley is very well equipped with top of the line appliances and plenty of storage for provisions and housewares. The galley is U-shaped with beautiful Black Galaxy granite countertops. The second guest stateroom is on the port side of the vessel at the base of the stairs from the Pilothouse. This stateroom provides two comfortable berths and a lighted, cedar-lined hanging locker. There is a 15" flat screen TV. Double doors open this area to the companionway where you descend from the pilothouse so the space feels large and friendly. Cabinetry is satin varnished teak and decks are teak and holly. This stateroom doubles as an office with a desk that is designed to securely store a laptop with easily accessible power and phone line. There is a hanging file drawer and several bookshelves and storage drawers. The VIP stateroom forward has a centerline queen island berth with six large drawers under the berth. All the cabinetry is satin finished teak. Each hull side is finished with overhead lockers with louvered teak doors and a cedar lined, lighted hanging locker. This stateroom has a built-in TV, telephone, CD stereo, berth reading lights and overhead lights. Two Manship screened overhead hatches provide light and fresh air. There is a large head with separate stall shower accessible from the VIP stateroom or the companionway to allow use as a day head and sharing with the port Guest Stateroom. The Lexan shower door is beautifully curved and framed in solid teak to make the best use of the space. Both the head and the shower have exhaust fans vented outside the vessel. The sink is an undermounted china bowl on a Black Galaxy granite top finished with teak fiddles. The deck in this head has been done in teak and holly. The Vacu-flush toilet has a switch to prevent cycling at night and waking the guests. The master stateroom is amidships full width, making it very light and roomy with teak and holly sole throughout. Tomfoolery has an island queen berth with eight large drawers under the berth. The bulkheads and cabinetry are all satin finished teak. There are two full-length bevelled mirrors on the aft bulkhead. There are two cedar-lined, lighted hanging lockers and a chest for drawer storage. The Asko full-size washer and dryer are located in forward lockers. A stereo/CD and the 17" LCD TV with DVD player is easily viewed from the bed. There is a beautiful teak nightstand on each side of the bed with 3 large dovetailed drawers mounted on stainless steel ball bearing slides. A swing arm lamp is mounted just outside the headboard on each side to provide perfect light for reading. A beautiful curved solid teak valance over the headboard of the bed has small halogen lights on a dimmer. The slots in the top of the valance diffuse the air-conditioning and send it out into the middle of the room, keeping cool drafts off the bed. There are 5 opening port lights with screens. When you want privacy, drapes can be closed to cover the port lights. The en-suite head is very spacious with vanity, Black Galaxy counters and teak and holly deck, under-mounted china sink bowl, Grohe faucet, several drawers and cabinets with shelves for storage of toiletries. A large linen closet over the head allows storage for several sets of towels and bed linens. The shower area has a large teak-framed Lexan door and the shower sides are finished in high gloss gelcoat trimmed in teak. There is a nice cabinet in the shower area to store toiletries. The Vacu-Flush toilet has a switch to prevent the unit from cycling at night. The tank tender is next to the head allowing you to see the state of the holding tank at a glance.